In their perpetual search for order, organization and efficiency, people have developed many interesting gadgets. Today, the well-equipped executive has a smartphone, a laptop, and a flash drive. Close to 150 years ago, he had a Wooton desk. The Wooton Desk Company was one of many office furniture-makers flourishing in post-Civil War America. From 1870 to 1898, it and its successors manufactured desks in and around Indianapolis; the region's abundant supply of immigrant craftsmen and timber, along with its proximity to railroads, made the city a national center for furniture production. The company was founded by William S. Wooton, who designed and patented the desks his factory produced. A hit at the 1876 Philadelphia Centennial Exhibition, Wooton's wares were soon being widely advertised as "The King of Desks." Though expensive, they sold well: Wooton customers included a number of the era's newly-rich industrialists and financiers, including John D. Rockefeller, Jay Gould, and Joseph Pulitzer, as well as hundreds of other, more mundane bankers, attorneys, and statesmen. Wooton had two patented desk designs. One was the "rotary desk," a pedestal-style desk with rotating segments. But the one that made the company's name was a tall, drop-front model officially titled "Wooton's Patent Cabinet Office Secretary." It was a massive object, ranging from four to five feet tall (depending on the model). Its exterior was usually made of black walnut wood, native to Indiana, with a burl walnut veneer and drawers accented with gold leaf. Interiors were made of other woods, including pine, maple, and satinwood, in a contrasting light color. A brass handle and brass plaques, including one proudly proclaiming Wooton's name and the desk patent date, decorated the doors. Each desk consisted of three parts: the central portion, with a drop writing board, and two paneled doors that swung out on brass hinges. When these sides were closed, the secretary locked, like a safe. The left door contained a glass window letterbox along with cubby holes and shelves of various sizes. The right side featured a series of pigeon holes with green cardboard drawers. The desk had 110 compartments in all. The secretaries came in four grades—Ordinary, Standard, Extra and Superior—and three sizes. The various parts were machine-made, though the finishing of the drawers and the ornamental carving, which grew more elaborate with each grade, was done by hand. In the higher grades, the use of light and dark woods so dear to Victorian hearts was often more pronounced. While each product looked unique, the Wooton desk was actually a machine-made product. In each model, the design, decoration, and number and arrangement of the various compartments were completely standardized, though clients could choose a cornice design from among different styles. Other than that, the company refused to customize models, claiming it was too "hurried in getting out our desks" to accommodate special requests, notes Betty Lawson Walters in The King of Desks: Wooton's Patent Secretary. Nevertheless, it may have made exceptions for such clients as President Ulysses S. Grant or Queen Victoria. The original Wooton desks made in the 1870s reflected Renaissance Revival style, with its characteristic massively square shapes and ornate carvings. But around 1880, the company altered the appearance of its desks, in keeping with the popular principles espoused by writer and Aesthetic Movement proponent Charles Eastlake, switching to simple, straight lines, less excessive ornamentation and "honest," undisguised construction. As a result, secretaries from the 1880s were plainer than their predecessors. The sides of the gallery atop the desk were straight spindles, not curved scrolls. The panels on the front and side of the doors were flat and square, not raised and arched. The woodworking was toned down, too. No pattern was carved into the panels; only the natural grains of the wood decorated them. Simplified or not, the secretaries were hardly Spartan. 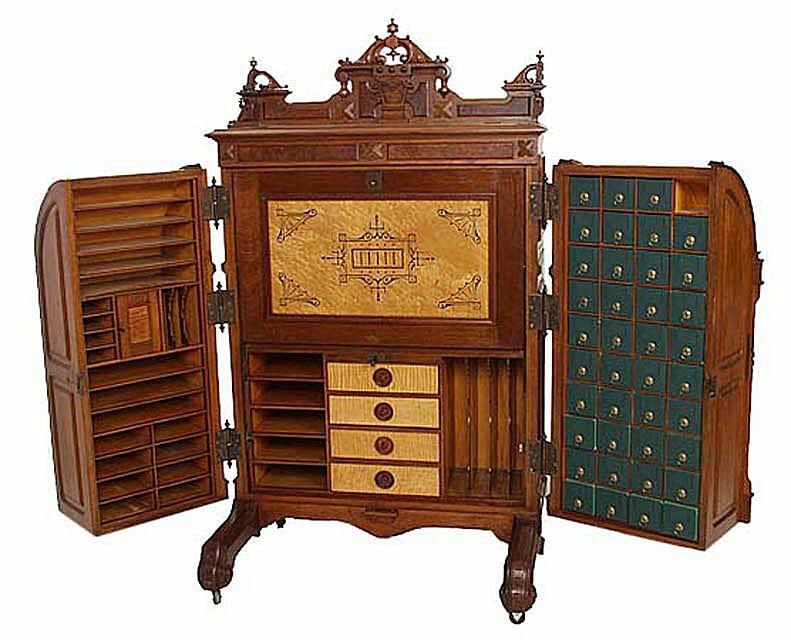 "The Wooton desk is an example of the Victorian mind at work—complicated, monstrous, full of holes," says Jeffrey Hogrefe in a 1983 Connoisseur article, "Order Reigns Supreme." But the desks' flamboyant design stemmed not just from the ornamental touches, but from the dizzying array of compartments themselves: the variety of storage and filing space that were their raison d'être. The Wooton desk offered incredible filing capacity, which had, up to then, been practically non-existent in office desks, notes Walters. Not an inch of space was wasted: even the gabled overhang of the gallery lifted up to reveal two levels of shelves. Ingenious and efficient, the desk appealed not only to Victorian industry's literal needs but also to its intangible ideals of an orderly, rational, and efficient world. In fact, one almost had a moral duty to be organized: "With this Desk one absolutely has no excuse for slovenly habits," as an 1884 advertisement proclaimed. William Wooton's original company manufactured the Patent Cabinet Office Secretary from 1874-1884. After that, Wooton retired to become a full-time clergyman. Wooton desks continued to be produced by a series of firms with different names until 1898, but it is those from the original decade that are the most sought after. Back then, the desks ranged in price from $90 to $750, roughly the equivalent of $1,531 to $12,765 in 21st-century dollars. Antique dealers nowadays charge anywhere from $25,000 to $250,000 for the desks, though some have been bought for four figures at auction so bargains do come around. Disciples of Charles Eastlake and the Aesthetic Movement believed that one's furnishings indicated one's character. The Wooton secretary reflects an idealized image of its owner: who but a captain of industry is fit for "The King of Desks?" Tall and majestic, a mass-made cathedral to the business world, the Wooton desk was fitting for a Victorian society that worshipped material success. What Were Five Revival Furniture Styles Popular in the Victorian Era? Is This a Fall-Front or Drop-Front Desk? What Is the Pique Technique Used on Antique Tortoiseshell Jewelry? What Kind of Antique Telephone Do You Have? Who are the Kings of Cowboy Collectibles?